The UPRM Entrepreneurship Network (E-ship) participated in the first W2 Socials at Betances Sur with keynote speaker Amaury Blondet. This idea exchange event was a great startup in building a sense of community within the emerging entrepreneurial talent of the western area of Puerto Rico. The man behind generating the idea of W2 Socials and cooperatively coordinating the event is Nathaniel Velez of Skiffer and member of the Fellowship of External Doers, who saw it fit to bring together people with like minds, who care about innovation and social enterprise. “People need to see each other face to face frequently. A social environment like this encourages the exchange of ideas”, said Nathaniel as he discussed the importance of community within the emerging entrepreneurial initiative of the University of Puerto Rico- Mayaguez. “Creative communities are built in universities”, Nathaniel recognizes, and a university community is one in which people with similar interests can get together and create liaisons for future endeavors. Events such as those of W2 Socials are responsible of propelling the entrepreneur community in the western part of the island and it is quite gratifying to see so many like minded individuals willing to pitch ideas and create contacts. The keynote speaker of the evening, Amaury Blondet of The BloC-O-Group and Idea939, gave a strong speech on Community as a Catalyst of the Entrepreneurial Ecosystem, which its central focus was on the importance of social gatherings for emerging entrepreneurs and how founding innovative projects needs synchronicity within its roles, such as founder, mentor, media, etc. “You need to integrate the different roles of an entrepreneur ecosystem. It is all about integrating, connecting, and networking” stated Amaury. Having access to people who are designers of innovation, who wish to solve problems, and open up space for people to connect and talk about things which matter is the overall goal of merging into a community of entrepreneurs. 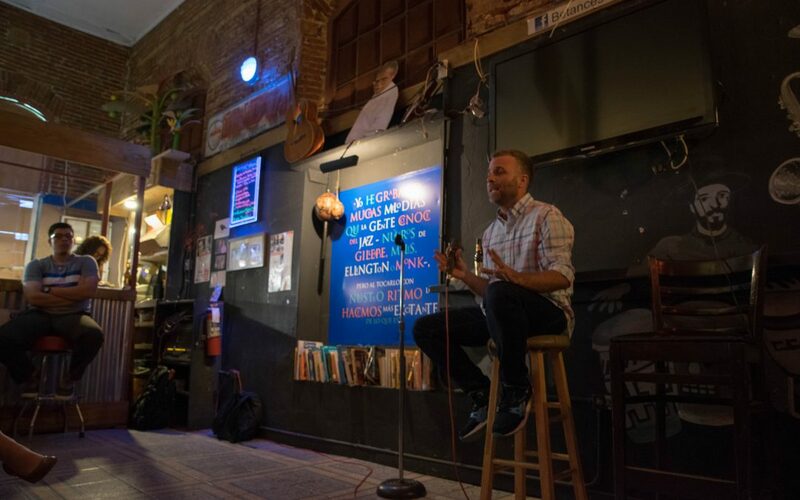 It is also exciting this type of event happened in an unconventional way, Betances Sur was a wonderful space to mingle and feel comfortable among peers. Amaury also commented “Puerto Rico needs this entrepreneur movement” therefore facilitating events like these are a must to encourage local talent to make themselves known. W2 Socials is looking forward to their next event (October 19) and encourages innovating minds in science, business, engineering, and arts to be a part of their gatherings. We at E-ship are looking forward to it, see you next time!